Raised in a privileged Parisian milieu, Morisot was the only woman to contribute to the first exhibition of the avant-garde Impressionist group, which opened in the spring of 1874. She painted this picture the following summer, during a joint vacation on the Normandy coast by the Morisot and Manet families. It was during this trip that Morisot became engaged to Manet’s brother, Eugène. Using radically simplified means (a few wispy strokes describe the seated figure’s veil; the sea and sky are flat as the canvas on which they’re painted), Morisot conjured a comfortably bourgeois scene. Her models were most likely her sister Edma and Edma’s daughter. Their pointed remove from the beach confirms their middle-class respectability—and, indeed, that of the painter herself. In 19th-century France, most young upper middle-class women received a basic education in the arts, but few were encouraged—or even allowed—to pursue professional careers. Berthe Morisot defied society’s expectations, earning both critical acclaim and commercial success as a painter. She made this work in 1874, on a summer trip to the Normandy coast with her sister. They stayed with the family of Berthe’s colleague, the celebrated artist Edouard Manet. That summer, Berthe would accept Manet’s brother’s proposal of marriage. Some scholars have noted that Morisot, unlike her male contemporaries, often shows women indoors or in sheltered locations. 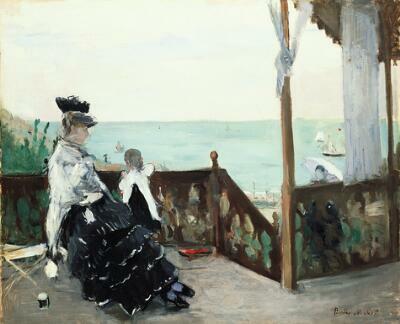 Here, she depicts her sister sitting on a high terrace, waiting to receive a visitor who climbs a stairway from below. The sitter is further removed from the sunny beach and glistening blue-green sea by a dark wooden railing. Her young daughter peers over it, perhaps drawn by activity below. Morisot’s subject matter may be appropriate to her time and social class, but she handles paint with a freedom that belies limitations. Clothing… architectural details… the soft, grey curtains… the foliage to the left…—all are painted with short, quick, suggestive strokes of color that create a spontaneous impression of a moment. On the sitter’s charcoal skirt, fluid white scribbles add a sense of energy to the foreground that contrasts with the smooth handling of the languid sea beyond—and perhaps conjures up small waves lapping at the shore. Imagine you’re the child in this picture. What are you thinking? Do you wish you were swimming or collecting shells? Are you imagining those sailboats journeying to faraway shores? Or do you just want an ice cream? Whatever the answer, you’re probably having a better time than the woman watching you, who has to sit in the summer sun wearing a long skirt, a shawl and a hat. She’s even got blue stockings on! She’s probably protecting herself from the sun, since in the 1800’s it was not at all fashionable to get a tan. In fact, the woman coming up the steps isn’t carrying a rain umbrella—it’s something called a ‘parasol’, which means ‘against the sun.’ Still, while this dress isn’t ideal beachwear, it does seem to belong in this scene. See the little white-edged ruffles on the skirt? Don’t they look like white-capped ocean waves? The setting is a beach, but the “subject” of the painting is the holiday itself. The little folding stool on the left is called a “camp stool,” a piece of vacation furniture viewers would have recognized as belonging in a rented house or resort hotel. Berthe Morisot painted In a Villa at the Seaside when she went on vacation with the family of her fellow artist Edouard Manet. That same summer, Manet’s younger brother proposed to her! Maybe this accounts for the happy sense of harmony in this villa by the sea.